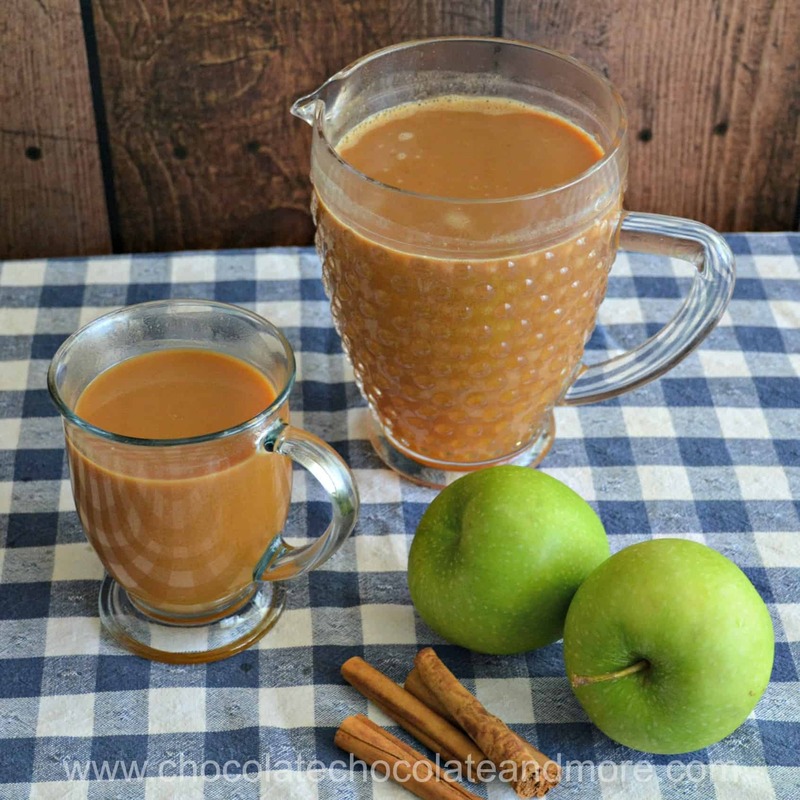 Caramel Apple Cider - Chocolate Chocolate and More! 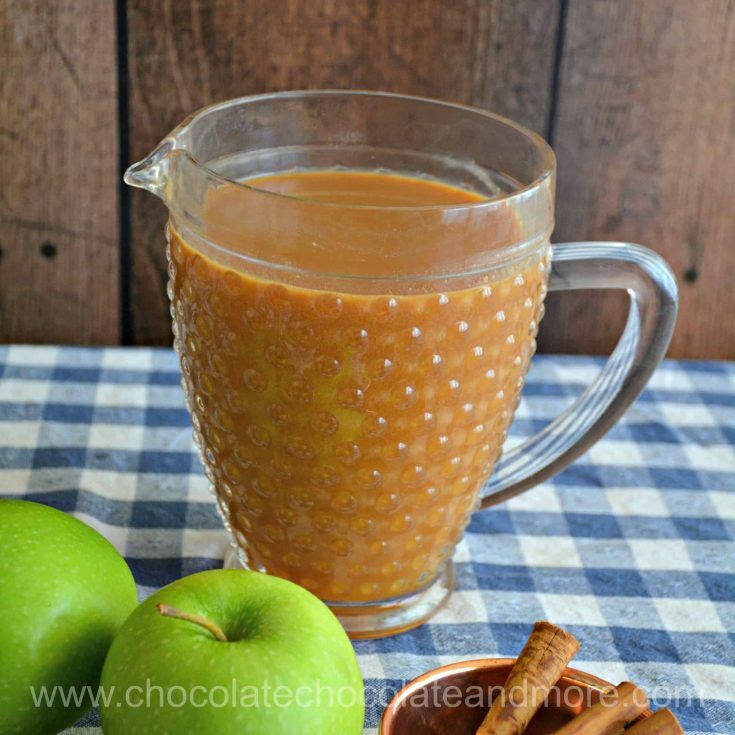 Stock up on apple cider because you’re going to love this caramel apple cider! It’s like drinking a caramel apple. Perfect for a cold winter day! I’ve been having trouble with my oven for the last 3 months. It heats up but then doesn’t hold the temperature. I had a repairman out a couple of months ago to fix it and he replaced the thermostat. But the convection fan wasn’t working and he didn’t fix that and the temperature still didn’t hold. So I had another repairman out last week. This guy was more thorough. He took the time to investigate and found the control board was the problem (in addition to the fan and possibly the thermostat). Turns out they don’t make the control board any more so I need a new oven. The timing couldn’t be worse with Thanksgiving coming up but I’ve been lusting after a double oven for 15 years. I bought a home warranty when I rented out my house. It was part of the agreement with the property management company so I didn’t have a choice in the matter. I had to replace my washing machine in August and the company only gave me $290 for a $1300 washing machine. So I wasn’t too hopeful about the oven. Well, they are giving me a reasonable amount to replace my single oven ($1900). Now the problem with getting a double oven is the size of the opening in my cabinets. My house was built in 1958 and appliances were smaller then. I think there was a double oven there originally but the owner replaced it with a single oven. Basically, the opening is 2-3 inches to short for a modern double oven. A friend of mine with carpentry skills is coming over this afternoon to help me make the space bigger. Here’s hoping it works! Until I get a new oven, you’re going to be seeing no-bake recipes. 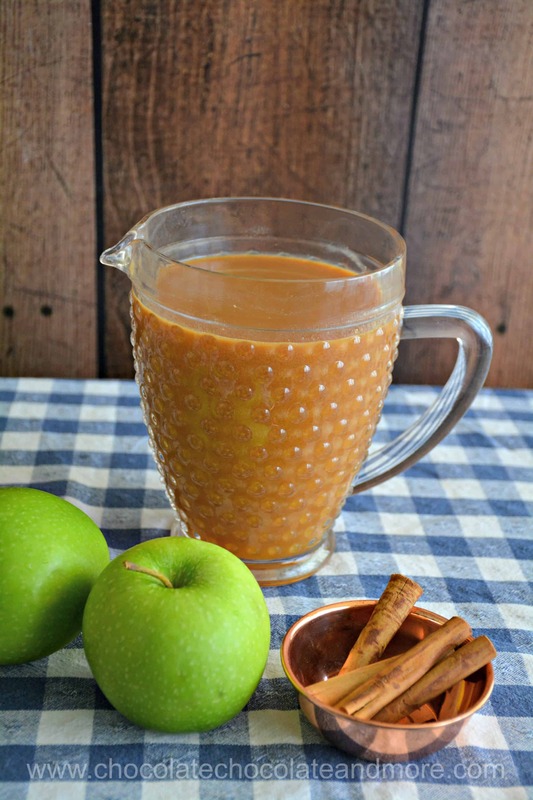 Now about this caramel apple cider. I visited my daughter during the Purdue Family Weekend last week. She took me to her favorite coffee shop where I had this amazing drink. 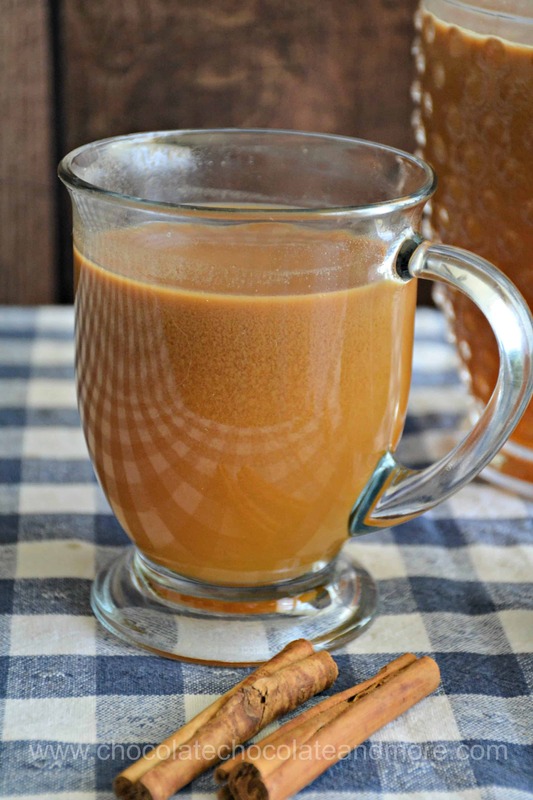 Seriously, caramel apple cider is like drinking a caramel apple. I love caramel apples and a cold front just blew in today so this is perfect. Place sugar, water and corn syrup in a 3 quart saucepan. Bring to a boil. You can place the lid on the saucepan for a minute or two to let the steam wash the sugar off the sides but don't leave the lid on too long. Boil for several minutes without stirring until you see the sugar start to turn color. It will first turn amber and then darken. Begin stirring with a long-handled spatula or spoon and watch the color carefully. You want the color to be slightly darker than store-bought caramels before you take it off the heat. When the sugar turns the right color, take it off the heat and immediately add the cream all at once. Stir while you add the cream but be careful of the steam. Add the butter and stir until it is combined. Then add the vanilla. 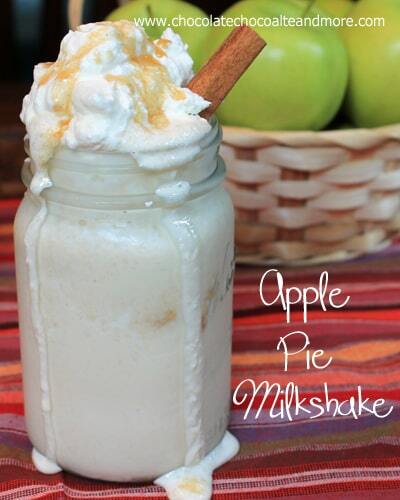 Let cool for a few minutes and then gradually add the apple cider. Stir until well combined. You may need to reheat it a bit if it's cooled more than you want. 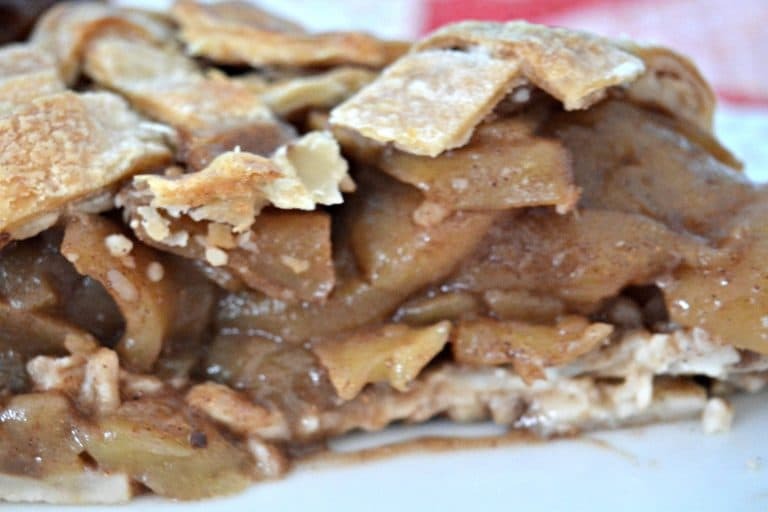 Serve immediately or refrigerate and reheat later. The mixture will separate as it cools so stir before serving. I kept a spoon by mine to stir it while I savored it.